Our Germantown event was quieter this year due to the weather. Some early rain, and then nice sun in the low 80s. Whole Foods Market was gracious to host our event. They provided us with the entire side row for parking our electric vehicles, and the use of their 2 Level 2 chargers. 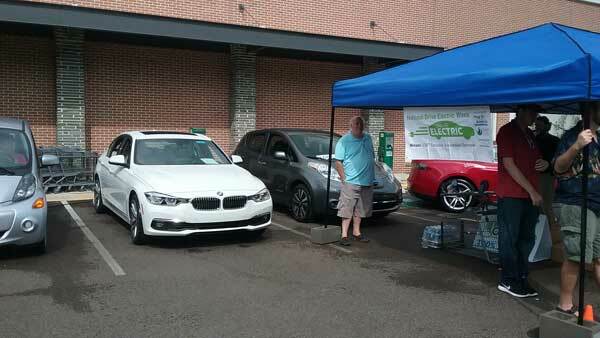 EV attendance was exceptional, most mass produced EV and plug in was represented at our event. They included 1 Mitsubishi Miev, 3 Chevy Volts, 1 Toyota plug in Prius, 1 Nissan Leaf, 1 BMW 330e, and 3 Tesla Model S. 2 dealerships attended, Sierra Chevrolet & Roadshow BMW. Chevy brought the new 2107 Volt, which they sold at the event, and BMW provided the plugin 330e for people to check out. The Whole Foods Customers, and their employees, were drawn to the cars. Clint brought his big tent, which helped keep the rain and sun at bay. Registered attendees report 66,010 electric miles driven.